The technology sector received more investments from private equity firms in 2016 than it did at any time in the last 15 years, according to a report released today by PitchBook. Driven by gloomy IPO conditions and a swirl of available capital, a staggering 567 deals worth $159.8 billion were completed last year. The logic: If PE firms were willing to inject sizable amounts of cash in venture-backed companies, then entrepreneurs didn’t see the need to exit in order to achieve liquidity. The report states that $60 billion of the $159.8 billion invested in tech can be attributed to the Dell/EMC take-private deal that closed in September. But it adds that even excluding that transaction, PE investment in the IT sector grew by 10.8 percent. Despite tech‏s strong showing, overall PE activity was much weaker. 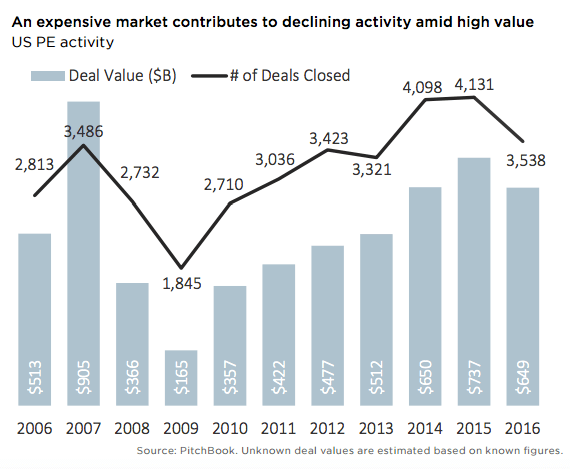 Deals were down from 4,131 in 2015 to 3,538 in 2016, and their value fell from $737 billion to $649 billion for the same period. The report attributes the decline to an expensive market and a lack of quality acquisition targets. Exits also slowed. 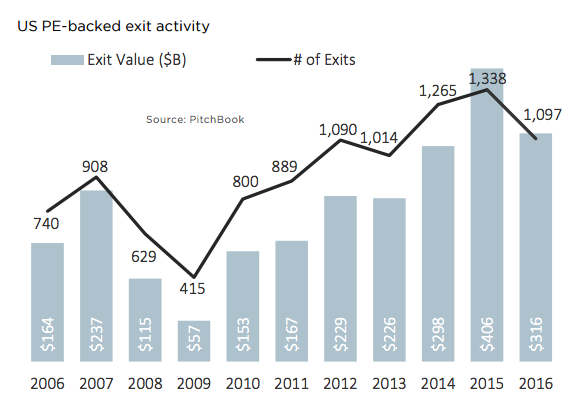 There were 1,097 PE-backed exits in 2016, totaling $316 billion, compared to 1,338 exits worth $406 billion in 2015. There were just 32 PE-backed IPOs in the U.S. last year, which according to the report, is the fewest since 2009. Also, with the stock market‏s poor performance, many companies that planned IPOs for 2016 simply postponed them. Looking ahead to 2017, Richard A. Martin, Jr., a senior director of Merrill Corporation, suggests a return to normalcy. “PE firms will still be looking to either execute a rapid sale of their best positioned portfolio companies while valuations remain high or further optimize their portfolios by offloading businesses with which they’ve done as much as they could to more specialist PE managers.“ After the froth of 2015, business as usual would be a welcome change. Promoção para a África do Sul! Joanesburgo ou Cidade do Cabo a partir de R$ 1.485! Datas nas férias de julho e Ano Novo! Últimos dias! Redes Accor e BHG oferecem até 40% de desconto nas diárias!